Girls who love to buy makeup have one common problem to struggle with and that is the right organisation of their make-up products. Organizing makeup is very important especially if you continue to buy new products without waiting for the ones you already have, to finish. And when we have something new, we start using that and forget about the old ones and keep lying in some ignored corner of our drawer and get expired. Therefore to avoid such wastage of makeup and to make sure that all your makeup items are visible to you and it is easy for you to pick what you are looking for on a particular time, you must invest in some functional makeup organizers like lipstick organizer, lip-gloss organizers, make-up brush organizers, eye-shadow palette organizers and nail paint organizers because these are the items that we continue to buy even if we already own plenty of these. Makeup items like concealers , foundations, blush, compact powder etc are usually limited to 1 or 2 in one's makeup arsenal because this are bought according to one's skin type. Here I have chosen 5 best makeup organizers for you which are not sturdy, useful, pretty and at the same time, affordable. 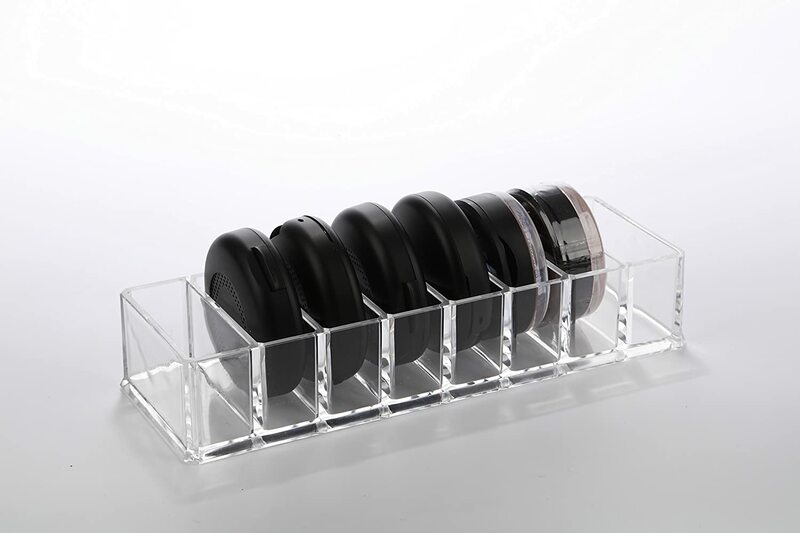 You can use these to organize your makeup mess and make use of every makeup product that you own. 1. Lipstick Organizer : "I have enough lipsticks" said no girl ever. Despite of how many lipsticks we already own, we still keep buying new ones which makes it difficult to use every single piece that we own because if they are not organised in a visible manner then we just forget about them. This lipstick organizer is the perfect answer to your "How to organize lipsticks ? " question. 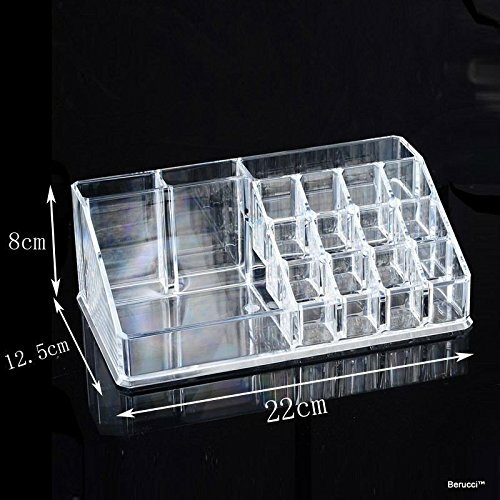 It is a clear lipstick organizer which can also be used to store foundations, contour sticks, concealers and pretty much every makeup product which is round/square and not wider than a standard lipstick. As it is clear so it will suit all types of decors so you do not have to worry about how it will look on your makeup table. It's dimensions are 5.75" x 3.75" x 1.75". and it has 24 compartments where the width of each of the compartments is 1" so it fits all types of lipsticks no matter thick or thin. For a very affordable price of only $5.99 , you can not go wrong with this. Click the image below to buy it. 3. Eye Shadow Palette Organizer : With all of the brands launching their new eye-shadow palettes so frequently, it is obvious to get tempted to buy more eyeshadows palettes than what we actually need or use. However it gets really annoying when you want to use a particular eye-shadow but end up using what you can find because you could not find the one you actually wanted . So it is very important to organize the eyeshadow palettes properly so that you can pick your favourite colour of eyeshadow when you want. 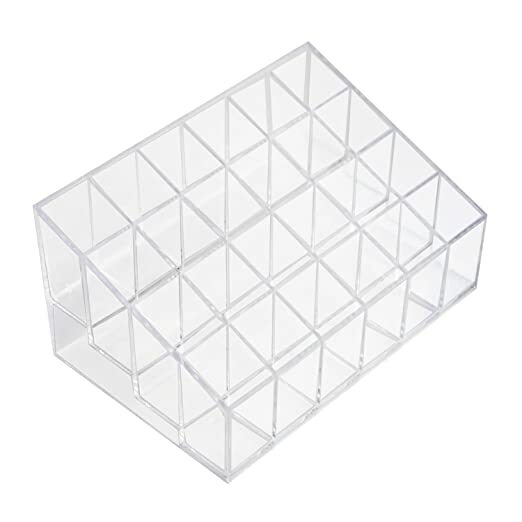 I have found a very useful and affordable eyeshadow organizer which can hold almost all of your eyeshadow palettes and looks pretty at the same time. The dimensions of this organizer are 9.25" Inches x 3.86" Inches x 3.20" so it can easily fit on or in your bathroom vanity and makeup table. 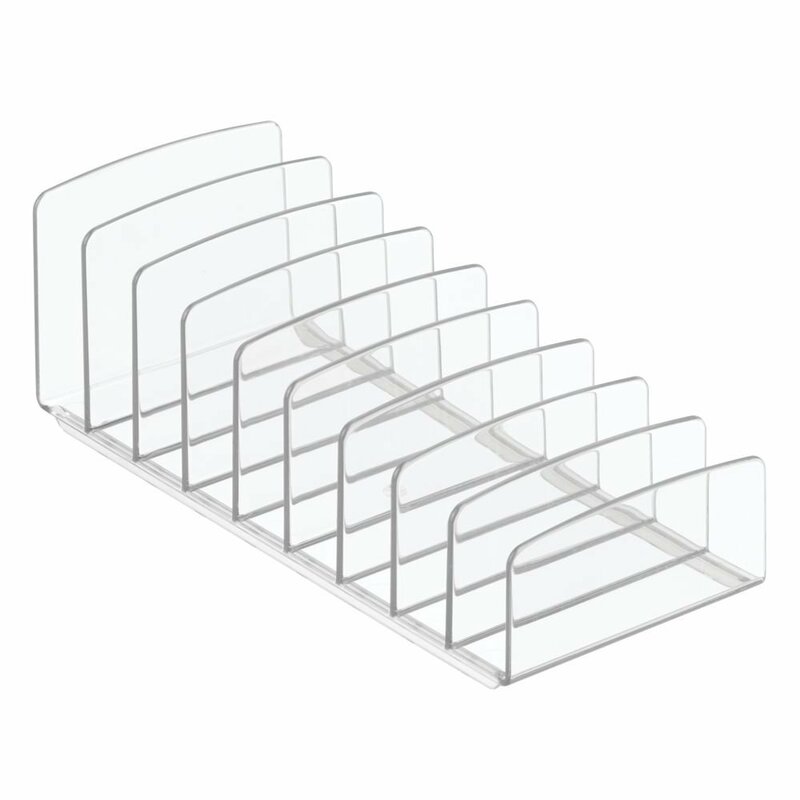 It is made up of plastic like clear acrylic material which is sturdy and works well with all types of decors. 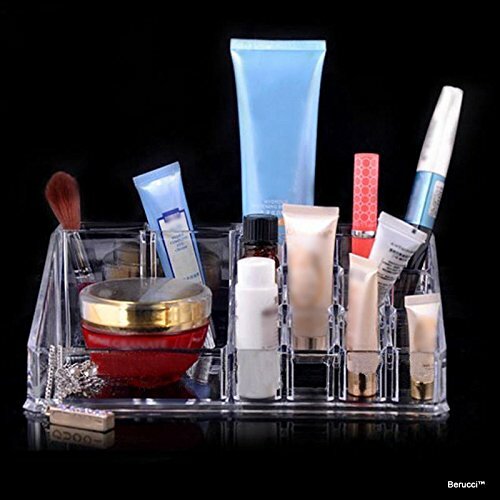 The price of this makeup organizer is $8.99 and you can buy it by clicking the image below. 4. Blush Organizer : Another makeup item that we can not resist ourselves to buy is Blushes, bronzers and highlighters. Despite of owning almost every possible color of the blushes, we always end up using the same coral or matte pink blush. It is because we do not know how to store blushes properly so that they are nicely visible to us and easy to be picked up when needed. I have found a very handy blush organizer which is affordable, durable and pretty at the same time. Not only the blushes , but it can easily accommodate your bronzers, highlighters and compact powders. It has 8 compartments and it has dimensions of 9.8Lx3.5Wx2H whereas dimensions for each of the slot is 2.95Lx1.1Wx2H so it can fit almost all blushes of various brands. Mac studio fix powder fits this product to the bottom. For a very reasonable price of $9.99 it is a must have makeup organizer for all the makeup hoarders out there. Click the picture below to buy this blush organizer. items , we do have some basic makeup essentials for day to day use and it is better if we keep them organized separately. It is also good for girls who like to have minimal make up items but want to store them in organized manner. So, I have found a makeup organizer which can fit your everyday makeup essentials like foundation, compact, primer, blush, bronzer, eyeliner, lipsticks, eye pencils and some makeup brushes and saves tons of space on your vanity. For a really cheap price of $4.99 it is a bargain. Simply click on any of the images below to buy this all-in-one makeup organizer. So, these are some of my favourite best makeup organizers because these really make your makeup area organized and clean. I hope you like these and purchase your favorite of these.